I am a software developer, I work on a computer, it’s what I do. Meetings are another beast though. I try to not take my laptop to meetings, even though practically all my colleagues do. I often get remarks about this: the IT chap is the only one without a laptop. Why? Well, people tend to be busy during a meeting with all kinds of things: e-mail, chatting, working on some document, etc. not related to the actual meeting. What a waste of time. Paper to the rescue: 2016 is the year I started carrying around a notebook to meetings instead of a screen. However, you do need a legible handwriting when taking notes with pen and paper and am not entirely happy with mine. It’s okay-ish but could be way better. The book is oriented to teachers teaching penmanship to kids but the level of expertise is unseen by today’s writing standards. It’s a simplified style of the “Spencerian Method”, which was the then standardised system of handwriting. 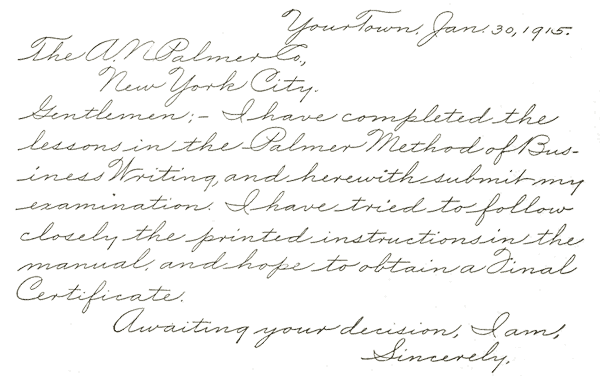 It’s apparently a popular handwriting system in the United States but I had never heard of it. The first 3 lessons in the book only talk about posture and holding your “penholder”. Not the most exciting part and I was anxious to start writing but it’s required reading. The whole point of lesson 1 to 3 is making you understand you are supposed to write with arm movements, not by moving your wrist. From there on it’s simply adopting the style by drilling, drilling and some more drilling. It’s all about getting the right slant and rhythm in your writings. I am doing daily 30” exercises for little over a week and already see big changes in my handwriting. This brings me to pens. Now that I am paying more attention to my handwriting I dug up my old fountain pen from secondary school, a Lamy Safari, and dove into the wonderful world of fountain pens. My 15+ years old Safari still works flawlessly, not bad for a €20 pen I never ever cleaned. Did you know you are supposed to clean fountain pens? Me neither. It’s the holiday season so I had an excuse to get a new fountain pen, even though the Safari still does a perfect job: the Lamy 2000. A piston filled pen designed by Gerd Alfred Müller in 1966 which looks like it came out this year. My dad got word of my new obsession and sent me his classic Pelikan Souverän. Think I caught the pen collection bug. The basics to improve your handwriting by Dyas A. Lawson. The place to start. Handy Dadroid’s video series on the book. Only the first few lessons but I find them more accessible than the formal English style used in the book. Full alphabet drills and downloadable worksheets at Loops & Tails. The Goulet Pen Company’s YouTube channel: a treasure trove of information around fountain pens. This post was drafted entirely by hand with my old and trusty Safari.